We offer advisory support, market insights and freight rate intelligence to freight procurement teams with multimodal transport needs. Our solutions are powered by cutting-edge technology and the latest market insights to support network management and freight procurement needs of logistics teams within global manufacturers and retailers. Our services are delivered by a highly experienced supply chains practice team who employ proven methodologies, cutting-edge technology and some of the most comprehensive, robust and powerful information resources available. 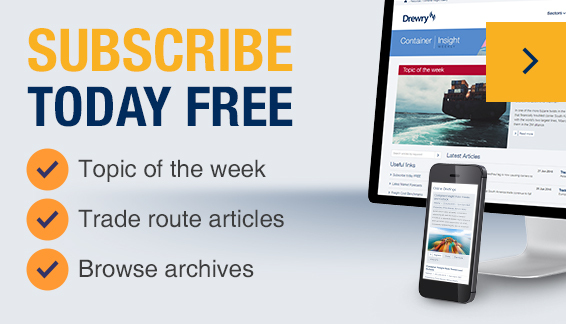 We provide monthly updates on the ocean, intermodal and air freight markets in Drewry's Sea & Air Shipping Insight product. This includes air freight pricing benchmarks covering up to 50 airport-to-airport combinations on both East-West and North-South trades. Containership reliability took a small step backwards in October as the average on-time performance across all trades reached 77.9%. Our advisory assignments cover a broad spectrum of commercial issues to meet your multimodal shipping needs – from freight rate benchmarking and ocean freight procurement support to network analysis, planning and supply chain optimisation. Our ability to field multi-disciplinary expertise and experience enables us to effectively address your specific commercial requirements, either working alongside client personnel or remotely.